-1-"Is that the sun?! Let's go outside and grill!" We're all enjoying the 40 degree temperatures here today. In western New York, we refer to this as "a warm up!" We get all excited and put on our spring jackets. It's quite sad really. But I'm hoping that some of the snow melts, since the weekend is supposed to go back to being frigid. There is a LOT of snow on the ground right now. I don't hate looking at it, but I'm tired of not being able to see around corners when I drive due to the mountain that has been plowed to the sides of every exit. Next week will also be more seasonable, so here's hoping for that meltage! -2-"Mommy, my blankets aren't working anymore!!" If any of you can translate this one, message me please. :0 This is what Anne announced to me this morning when I opened her bedroom door. She's battling a cold, and had a rough night of sleep as a result of the coughing. My suspicion is that she felt chilled, maybe? I'm not certain, but she is absolutely adorable, standing there in her sleeper with reindeer feet and very pink cheeks. Broken blankets. If only this was the main thing on my list of worries. :0 Cutie pie. I do feel badly that she's sick, and none of us slept well last night as a result. Offering up the sleepless night, which is needed since I'm doing very poorly keeping to my Lenten resolutions. This is not exactly a new phenomenon. :0 I always try, and some Lents go better than others, but never does it go 100% as planned. I've been doing my Morning and Evening Prayer...sometimes. Which is better than never, right? I have maintained my fasting from sweets at lunchtime, that has gone well, and each time I get to the end of my lunch I remember what I gave up and why I'm doing it. That's a good thing. I've been good about starting my rosary each day in the car, but I don't always get to finish all 5 mysteries. I'm doing what I can, and trying to do better. In his podcast "The Break" this week, Fr. Roderick talked about this very issue, and said that for him, this Lent is about a fresh start. He's been trying to declutter his apartment and give some things away, so that he can live more simply. I really relate to this message. It doesn't have to be anything major. We are just trying to do good things and freshen up our spiritual lives a bit. I mentioned last week my love of orange and my hunt for a new dance costume. I love orange. It's just such an underappreciated color, don't you think? It needs some love. I adore orange, but I also adore a bargain where dance costumes are concerned. They can be expensive, and I don't have a big budget for them. I often shop used. And I like it if a costume can be worn more than one way, maximizing the use I can get out of them. This works best in Middle Eastern dance with a bra and belt set. You can switch out the skirt color/type, and voila! Looks like a whole new costume with minimal expense. And so we get to my weekend plans. Saturday the big event is my pilgrimmage to the hair salon, which I make every 10 weeks. Kind people have complimented me in the past on my hair, saying "and you don't have any gray!" Welllllllllll. :) I don't have any gray because I dye the gray out of my hair, and I'm going to be honest: I feel 0% guilt about this. Gray hair is lovely, just not on me. :0 I am a natural brunette, and the gray strands stand out very noticeably when they dare to make an appearance. Plus, their texture is SO different from the rest of my hair, it just looks weird. Thus, I am unashamed to admit that I color my hair and I plan to do so for the foreseeable future. I plan to "not have any gray" well into my 80's. -7- "One, two, Plie three, four..."
All right everyone, the countdown to my fish fry has begun. 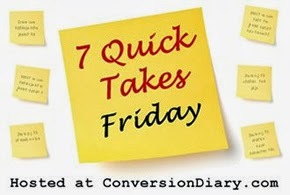 Check out Conversion Diary for more 7 Quick Takes! See you all next week!